Our client, an important board mill, generates between 100 and 200 litres of industrial water per day, following the rinsing and daily cleaning of its production tools. These waters, maintained at room temperature, are loaded with glue, varnish, ink and heavy metals. The plant has been equipped with a NISKAE SW100 treatment station to recycle its wastewater. To determine the formula necessary for the chemical sanitation of the water, we conducted an analysis of a sample of wastewater. Based on the lab results, a custom coagulation and flocculation product was prepared to guarantee maximum efficacy. The flocculant is operated in small quantities and presents no danger to the user nor the environment. Each sample of single pollutant required between 2 and 2.2 gr/L coagulant NISPUR 1677 BC2Z/2 for a good water clarification. 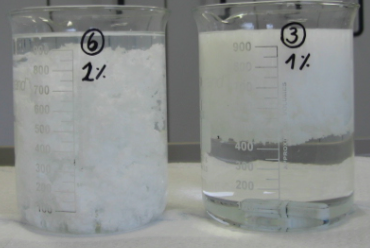 The pH of the isolated pollutants after treatment varies between 6.8 and 7.5. The amount of sludge from isolated pollutants varies between 55 and 75% (percentage by volume of sludge, flotation and sedimentation), the filtrate is clear and clean. The mixture of glue, ink and varnish required 2.0 GR/L of coagulant NISPUR 1677 BC2Z/2. 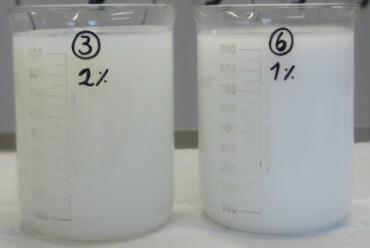 The PH of the mixture after treatment varies between 6.84 and 6.58. The filtrate is clear and clean. Learn more about the installation of the SW100 wastewater treatment station.